Enter to Win a Kindle Fire + Weekly $100 Amazon Gift Cards! 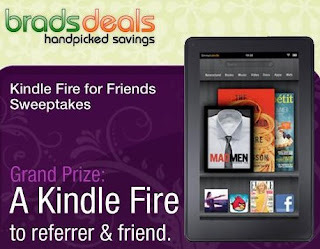 Enter BradsDeals Kindle Fire for Friends Sweepstakes and you and a friend could win a Kindle Fire! Along with that grand prize, you'll also be entered to win several weekly giveaways of $100 Amazon gift cards! Ends 12/20/11. To enter, simply fill out a short form...that's it! You can increase your odds of winning if you invite your friends to enter. If one of them wins the Kindle or Amazon prizes, you win too!